I didn’t know I wanted to see all of my favourite childhood characters turned sinister until the announcement of NieR Automata director Yoko Taro’s smartphone game SINoALICE. 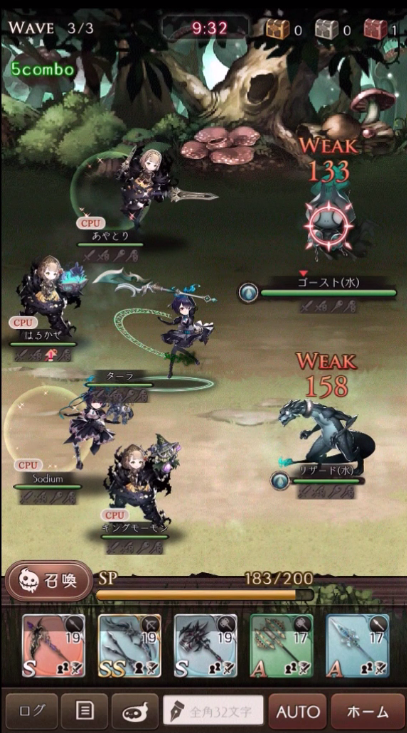 Partnering with successful developers of smartphone games Square Enix and PokeLabo games, SINoALICE has a lot of potential as a quick and fun RPG experience, with bite-sized pieces of dark story that are quick and easy to cycle through, along with weapon-based combat that combines familiar elemental JRPG mechanics with interesting new ones. Although it has a few technical bumps in its current form, what I’ve played so far has given me confidence that with enough support technically and events to keep it fresh, in good time SINoALICE could be the dark and unique smartphone JRPG that the smartphone world was missing. SINoALICE’s characters are all based off fairy tale characters that will be easily recognisable to most players. There’s Alice, Snow White, Cinderella and other familiar bedtime story characters, but they’re intriguingly different to the ones we know. They live in the Library world and share a wish to revive their creator in order to continue their story and get the ending they desire. In order to revive the creator, they must fight Nightmare creatures that destroy stories and will eventually have to fight each other. Their dark desires and tendencies were interesting to see detailed in the small bits of text displayed alongside battles, which made it easy to consume the stories little by little on the go. Like the small pieces of story, the three round battles are also very quick to get through but are involved enough to feel satisfying. Enemies are all assigned an element and in order to deal the most damage to them, you can attack them with their opposing element and your own character’s best weapons to beat them with ease. Together with a party of 4 CPU’s, the three wave battles have all gone by for me fairly quickly so far, even with a boss battle at the end of most of them, but the higher level ones are just long enough to need strategies such as choosing the right weapon or summon to win and keep things interesting. Challenge comes into SINoALICE in some of the later chapters of the stories. 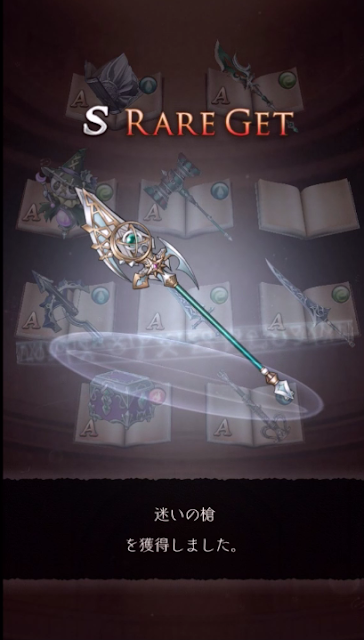 Attacking by using your weapons costs SP plus the weapon itself temporarily and in later chapters, in order to pack a punch they need to be used more frequently. 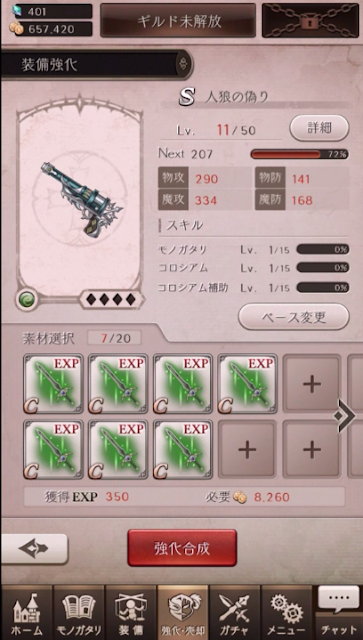 SINoALICE allows you to carry more weapons into battle as you level up, but the more weapons you have, the more SP you are using, especially if you’re restoring your weapons to use them a second time round (which I’ve needed to do a few times). While the first couple of chapters I played through in Alice’s story weren't that challenging, I’m enjoying the balance between health and SP and am interested in how this will continue in later chapters. The equipment/SP balance be better value if you level up your equipment using the experience giving rewards from battle. Since you can (and should) equip multiple weapons that are used very quickly, being able to raise the level and rank of your equipment is a good way to become stronger, aside from just grinding your characters in the unique, fun touchscreen quick Nightmare Cleaning mechanic to get quick EXP. Both work as good alternatives to replaying levels over and over and I liked the feeling of choice and involvement in these aspects instead of paying to restore things or for better resources. Being a smartphone game, SINoALICE features a familiar gacha system to help get better equipment. Unlike some other gachas, characters aren’t won through this system, which made the system feel a little fairer than most other Gacha systems, as I wasn’t going to be that sad if I didn’t get the weapon I wanted because I could still upgrade what I got or unlock a character that better suited the equipment I won. It’s this kind of thing that makes me feel more comfortable in playing SINoALICE, as so far I haven’t at all felt the need to use real money in it to improve my experience. While I’ve been enjoying my time in SINoALICE so far (particularly the last few days where maintenance periods have been much less), it still has a few kinks in it that make it not as easy to jump into as other smartphone games. I’ve had a few experiences where I’ve finished a battle and it hasn’t gone to the reward screen correctly unless I disconnect my internet, only to take me back to the top screen. It’s also had to boot back up while starting a few times, but this error seems to have been fixed as SINoALICE has more maintenance's. These are all problems I’m sure will be fixed very soon (possibly even by the time this is up) as it’s been pretty dedicated to fixing and smoothing things out in its first week and I’m sure that if it sees a localised release, these problems will likely be long gone by that point. SINoALICE brings Yoko Taro’s standout unsettling narrative-sense into a bite-size form, with it’s storytelling and quick battles fitting well on smartphone. The weapon-based combat and gacha system created a unique take on turn-based smartphone gameplay and with access to plenty of characters and story apps without paying for a thing, whether or not players choose to pay for the experience, it’s easy to get into SINoALICE regardless. I enjoyed the innovative character leveling systems and branching stories and while the experience isn’t 100% smooth yet, I’m looking forward to sticking with it for awhile and hope it sees a localisation at some point to better understand these dark characters. 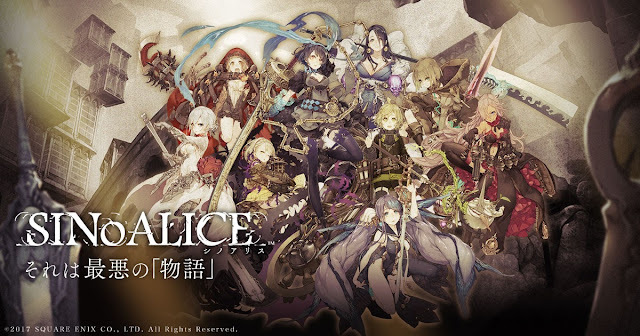 SINoALICE can be downloaded now on the Japanese App Store or Google Play Store. Do you want SINoALICE to be localised? Which character design is your favourite?